We encourage you to live with us at the DK House Sapporo.! We are very happy to offer you FREE RENT in April and May if you move in April and stay with us for at least 1 year. ・This offer limits 10 standard rooms. 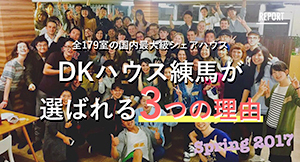 ・Entry form is only accepted between March 11 and March 29 2018. ・ You must stay at the DK House Sapporo for at least 1 year. If you leave the DK House Sapporo within a year, there is the penalty that you need to pay the free rent, April and May you receive. ・ You need to pay the normal rent from the month of June 2018.